There are many ways to travel to Scotland such as by car, plane, train and coach. It’s also probably much easier than you think. It’s very easy to travel to Scotland from England and Wales and you have a choice of making your journey by road, rail or air. From London and some other major cities you can take a direct train to Glasgow or Edinburgh. If you’re departing from other cities or towns you may need to change. The Caledonian Sleeper service is an overnight train service running between London and Scotland. It leaves from Euston station in London and there is a Highland route which serves the Highland destinations of Fort William and Inverness plus Aberdeen, visiting various stations on the way. The Lowland route goes to Glasgow Central or Edinburgh Waverley. Again, you can get a good ticket price on advance bookings. Trans Pennine Express – check timetables and fare prices for anywhere in the UK. On this website you can buy tickets in advance to get the best deals.They don’t charge booking and credit card fees unlike some other websites. If you enjoy travelling by train on holiday and want to make the journey part of your holiday, you should look at tour operators which provide tours of Scotland’s Highlands and Islands by train such as Great Rail Journeys. From these major transport hubs you can then continue on your journey to the Scottish Highlands and Islands. If your itinerary allows it’s also worth taking some time to explore these vibrant Scottish cities. Flight times from UK airports to Scotland can be as short as an hour. Flybe provides a great range of flights to various destinations in Scotland including Scottish cities, isolated islands and the Scottish Highlands and far north of Scotland. Book your cheap flight to the Scottish Highlands and Islands or find out more information on the Flybe website. Not sure if you need a passport to travel to Scotland? See Do you need a passport to go to Scotland? Travelling to Scotland by car can be an adventure in itself. Driving gives you greater flexibility to stop and enjoy the beautiful views of which there are lots! If you’re going to be driving in rural and remote locations, you will have to drive on single-track roads so make sure you know the do’s and don’ts of how to do this by watching the video below. There are various car hire companies in the Scottish Highlands & Islands including local businesses and Hertz UK and Thrifty UK. Hertz UK have locations across the UK and in Scotland you can find them in Edinburgh, Inverness, Glasgow, Dundee and Elgin. Coach or minibus tours around the Scottish Highlands and Islands depart from towns and cities across the UK and vary in length from a weekend to a few weeks. If you don’t want to spend your whole holiday on a coach trip, you might want to consider doing a bus tour as part of your holiday. A cruise can be a relaxing way to explore dramatic coastline of the Scottish Highlands and Islands. Whether you want all the amenities provided by a large cruise ship (such as with Fred. Olsen) or a more intimate experience on a boat which accommodates only a small number of guests, there is a cruise for you. See our section on cruises and tours around the Scottish Highlands and Islands. So now you know how you’re going to travel to Scotland, find out when is the best time to visit Scotland. 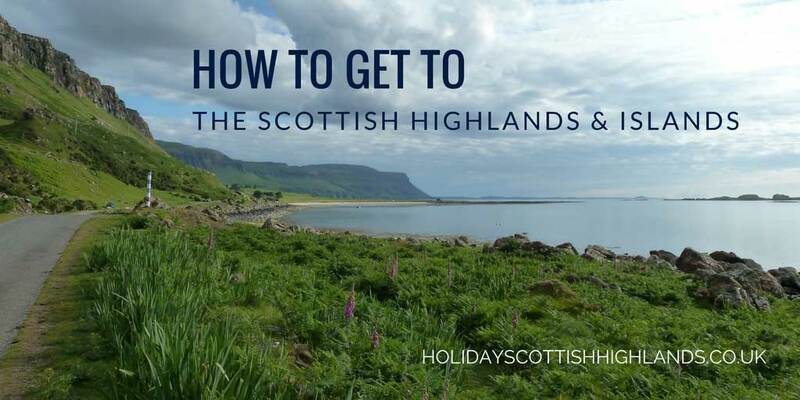 Check out our destination guides and our local tips for what to see in Scotland’s Highlands and Islands.